I was driving towards our Parliament House this afternoon and noticed a lot of temporary barriers being put up along the roadway. I later learnt that the barricades are being erected to protect runners in Thursday's Olympic torch relay from as many as 20,000 protesters (pro China and pro Tibet). 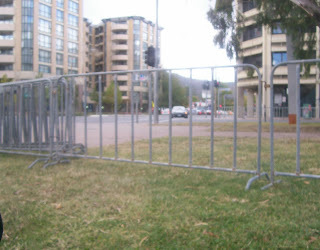 The entire 20 kilometre route is going to be fenced off from the public as the relay will pass some of the nation's most sensitive buildings, including Parliament House. 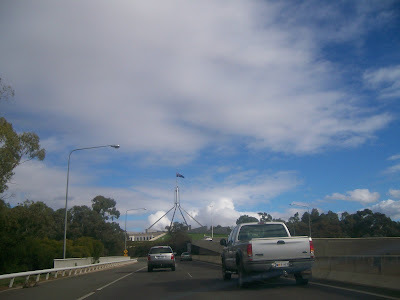 It is apparent that trouble is expected here in Australia's capital. There is a lot of talk that plain-clothes Chinese security officers will be infiltrating the crowd. In a bid to out number pro Tibet protestors, the press is also reporting that the Chinese embassy has hired more than 50 buses to bring in pro-Beijing protesters, offering free food for participants. A friend of mine in the Chinese community said the embassy was organising Chinese students to form a human wall behind the barricade. It's going to be interesting what happens next Thursday given this is the only city in Australia the torch will be travelling through. I will be going to take a look and will let you know what happens. Let's hope democracy rules, peacefully....and that the pro-Beijing protesters realise that they would not be allowed to demonstrate in China....so no agitation is necessary here either...thank you very much. Wow, all I can think of is what a shame that something as unifying as the Olympics has always been in the past has deteriorated to this. Protesting goes against the very Olympic ideal, to bring together nations to compete in sports, and garner closeness and familiarity among the athletes. Such a shame that people choose this venue to protest political agendas. Then again, the International Olympic Committee knew about China's record when they decided to award the games to Beijing. Do let us know how it goes on Thursday, and don't get too close. Be safe, because you just never know how these things might turn out.